This week’s blog is the first of a DANGERous two part story. As you may know, I’ve started to compare different cheesesteak restaurants as I discover more and more in my sandwich journeys. Inspired by this, I wanted to take on a rivalry that is very well known in Los Angeles: Which is the better french dip place? Philippe’s or Cole’s? French dip sandwiches are incredibly popular in Los Angeles, and there is a restaurant serving them in every neighborhood in the LA Metro area, but these two downtown LA locations are the most popular, and for good reason. 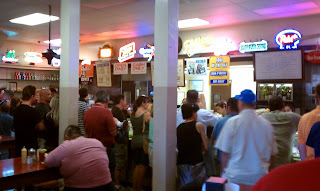 Both Phillipe’s and Cole’s argue back and forth as to which was the first french dip place in Los Angeles. Whether or not you have proof to either side of the story, or even care which is the original, each place has their own diehard fans. Before tackling the French Dip in Los Angeles, I had only eaten at Cole’s. So to see what the other side is talking about, I decided to take on a French Dip sandwich at Phillipe’s and compare the two sandwiches. Phillipe’s this week, Cole’s next week. Showing up at 6pm on a Saturday night, I was greeted with 4 lines to the front counter, each one stretched to the back wall. A cafeteria style setting with wood chips on the floor, this place looked like it hadn’t been updated in 80 years. But the decor is not the sandwich, and for this sandwich I ordered the Lamb French Dip with bleu cheese. The lamb was delicious. Roughly chopped into delicious, flavorful, and moist chunks, this sandwich is packed with meat, and definitely will fill you up. The bleu cheese isn’t used sparingly either. My first bite filled my mouth with about half of a block of cheese. They top the meat with two thick slices of bleu cheese. 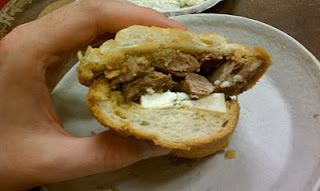 As I’ve mentioned before, Bleu ranks highly with me just like feta and goat because of the texture and taste. It was an excellent choice for this sandwich. Pungent, dry, and creamy, it is the perfect choice for the succulent chunks of lamb. The home-made mustard is an excellent condiment to use with this sandwich. Prepared in-house, it is blended with horseradish and is quite a kick if you use too much. 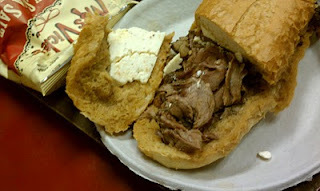 The roll was light, flaky on the outside, and doughy on the inside, a great combination for a french dip sandwich. And speaking of which, here comes my one complaint. 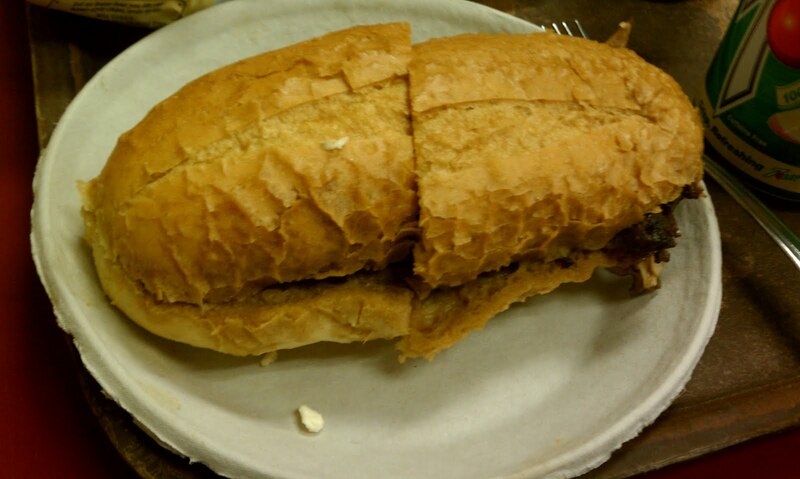 Phillipe’s dips the sandwich for you. You don’t get a separate cup of au jus to dip your sandwich in, and decide how much should be dipped, or not dipped. A few problems arise from this. 1.) it could be dipped more than you want, creating too soggy of bread. 3.) you can’t choose how much you’d like to dip it. Is this really a huge problem with the sandwich? Not entirely. I feel like I would enjoy the sandwich even if it wasn’t French Dip, as the meat and cheese paired perfectly. But I do enjoy a French dip sandwich now and then, and I do like to dip and then not dip, depending on my mood. Overall, this is truly a DANGERously delicious sandwich that should be on the list of any sandwich fans checklist. But the eternal question: Is it better than Cole’s? Well dear reader, for that answer, you’ll have to check back here next week. Dipping the sandwich for you annoys me as much as people from Oregon having their gas pumped for them. Some things need to be left to the diner as part of the traditional experience. This is a good commentary though on society as a whole which seems to value laziness and products that take even the smallest amount of work and effort out of your daily routine. But I digress. The French Dip is a sandwich to dip, yourself. If confronted with two tasty sandwiches of equal enjoyment I would always go to the place that let me dip it myself. I fail to see the advantage of dipping it for you, unless they think they can dip it better than you can, which is doubtful. I mean how would you feel if you were at camp sitting by the fire and when it was time to make smores the counselors just brought some already made ones to you. Not so good. I agree, when I have a French Dip sandwich, I want to be in charge of dipping my sandwich, thanks so much. 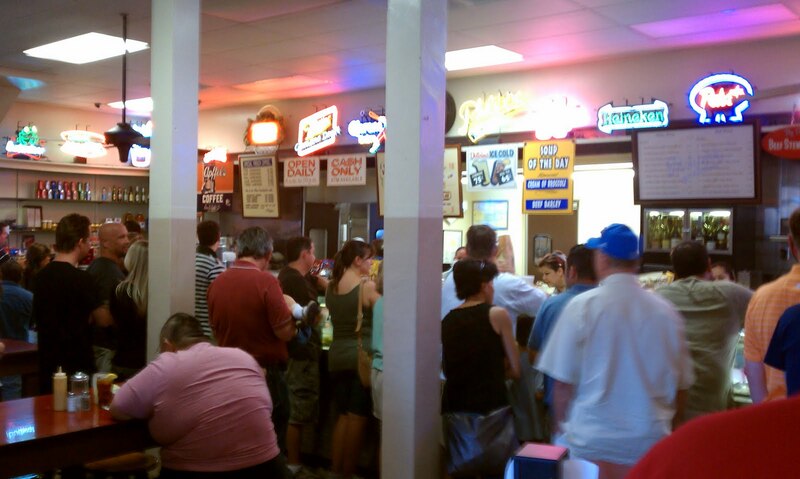 Which is why, even though it’s not one of the best, Canter’s is a restaurant I enjoy in LA for French Dip. They give you this lovely tureen of Au Jus to dip your sandwich, and if you so choose, your fries as well. Quite a good place that Canter’s. VERY interesting. i never thought a french dip would be made with something other than roast beef and swiss. horseradish is a must. and i would prefer to have the au jus on the side. i like to control how much or little i’d like to dip!